Our sparkling (and sometimes not so sparkling) freshwater ponds have been called the soul of the Cape, the eye revealing the aquifer below. We celebrate these ponds throughout the year. In summer, healthy ponds are our refuge when beaches are too crowded or too sunny. Our fishing holes, our kayaking and canoeing spots, and our nature labs. In winter, our skating rinks! Year round, they are places of peace and contemplation. To put our ponds in context, we start with some background on their place in our watery world, and then discuss their problems as well. Let’s begin with the concept of watershed. All ponds are the low point of a watershed, which is defined as that area within which all water flows to the same low point. Estuaries and ocean are also low points of watersheds. In fact, all land falls into a watershed, so all of us have a watershed address! Do you know yours? Why is the concept of watershed so relevant? Because the problems of a pond derive from activity in its watershed. Such human activities as use of septic systems, fertilizing, and creating roads which send pollutants through drains to ponds and estuaries are the principal controllable sources. As you may have noticed, while ponds are clear in April, by midsummer some are opaque and green with algae, unpleasant to swim or boat in. Last summer, one Orleans pond was closed because of the presence of toxic algae. These unpleasant events occur because our freshwater ponds suffer the same ill effects of excess nutrients as do our estuaries. While excess nitrogen is the nutrient blamed for our estuary problems, excess phosphorus is the troublesome nutrient for fresh water. Unlike nitrogen which flows rapidly through its watershed at about a foot per day, phosphorus moves slowly through its watershed to its eventual resting place, about three feet per year. Once phosphorus reaches ponds, it is difficult to remove because freshwater ponds on Cape Cod have few outlets and the ponds rarely flush. As a result, phosphorus builds up in the sediments at the bottom of the pond. Thus begins a cycle: as phosphorous flows into a pond in the cooler months it settles and is bound in the pond sediments. Water temperature changes in the spring and spring and summer winds stir up the sediments and make the phosphorus available to algae for their warm weather growth. As algae blooms grow, they block light in the pond and cause plants in the water to die and fall to the bottom where micro-organisms use oxygen to decompose the plant material. This process depletes oxygen in the pond and causes fish and shellfish kills. This process must be interrupted to keep ponds in the state we humans enjoy, while still leaving nurturing space for the natural ecology of the pond. As the ecology of the pond requires some nutrients, it is truly a balancing act. There are both preventive and remedial ways in which the freshwater ponds can be protected. In this article we discuss preventive measures. On Cape Cod, we can control the human deposits contributing to the bulk of the problem. Septic systems are the source of almost 80% of controllable phosphorus and nitrogen on Cape Cod. Road and paved driveway run off cause a significant additional amount. When it rains, fertilizer, herbicides, pesticides, oil, gas and soaps run quickly off paved surfaces to a low point at the nearest water body. Fertilizer running down an unpaved driveway or seeping into the water table directly from a lawn adds another significant measure of phosphorus and nitrogen. Finally, pet and farm animal waste contain concentrated nutrients which storm water can carry into ponds. Orleans has 60 freshwater ponds. They range from small wooded vernal pools to four Great Ponds that are over ten acres in size (Cedar Pond, Bakers Pond, Pilgrim Lake and Crystal Lake). Bakers Pond has public access for fishing and boating only. Pilgrim and Crystal Lakes have public access for swimming, fishing and kayaking. 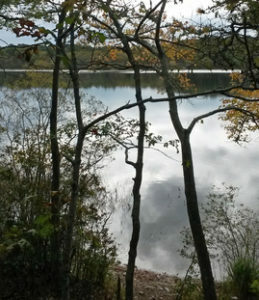 Pilgrim Lake also provides breeding habitat for herring that migrate from the Atlantic Ocean through Pleasant Bay and Lonnie's Pond to reach this habitat. Starting in 2000, citizen volunteers have continuously monitored water quality in twenty named ponds. A review and interpretation of the data from 2000-2005 is available on the Town of Orleans website. Pond samples and data are now collected from Orleans ponds in spring and late summer. Overall, freshwater pond water quality continues to decline due to inputs of phosphorus. This comes from fertilizer and runoff from paved surfaces. Most ponds do not meet the state standards for clarity and dissolved oxygen during the summer. Two ponds exhibited high levels of cyanobacteria (blue-green algae) in summer of 2012. Populations of this organism can explode to produce a green scum on the pond’s surface and a poisonous toxin. This causes illness in mammals including dogs that drink it and skin rashes in humans. A warm summer with very little rainfall exacerbated conditions. Cedar Pond showed stress and large amounts of floating aquatic plants and macroalgae again in 2012. U Mass School of Marine Science has been engaged in additional water and sediment sampling; results will help to determine future best management practices for Cedar Pond. The cormorant population has been tallied over a two-year period to assess the nutrient load that it adds to the pond. Roosting birds exceeded last year’s total with over 600 per night in October. US Department of Agriculture has been requested to study cormorant dispersion techniques that can be used at this location. Property owners play a vital role in maintaining the quality of our ponds. Each abutter is responsible for maintaining a vegetated natural buffer along the waters’ edge. This native vegetation helps to absorb runoff and excess fertilizer flowing toward the pond. Adopt a Cape Cod lawn fertilized only by grass clippings or use natural ground covers that do not require fertilization. Parking lots and roadways should be drained into remediation structures that absorb phosphorus carried off by precipitation. Vernal pools are vital habitat for breeding toads and salamanders. Freshwater ponds and lakes are vital habitat for ducks, geese, turtles, muskrats, otters and hundreds of other species. Thousands of migratory songbirds utilize the shorelines and capture insects over the surface during the summer. Enjoy these beautiful spots in our landscape. Many of our ponds can be observed by utilizing trails systems maintained by the Town Conservation Department and Orleans Conservation Trust.